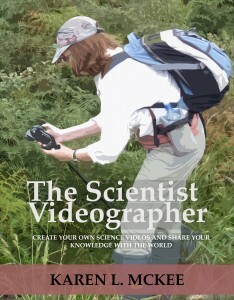 I produce tutorials showing how to make science videos, for example with an iPad. Other tutorials include how to do animations for your science video project, how to use the rule of thirds in video composition, and many other aspects of videography. Have you ever gotten a comment about one of your videos that contained a personal attack or profanity? Are you wondering how best to deal with such comments? About comments that are just critical? In a new video, I offer my perspective and experiences and describe ways to deal with negative comments, including how to handle comments that are critical but otherwise civil. Have you watched colleagues give a conference talk or seminar containing video clips and wondered how they did it? Or perhaps you’ve tried embedding a video in your PowerPoint presentation, but it did not play well or at all? In a new tutorial, I walk the viewer through the steps to preparing and inserting a video into PowerPoint so that it plays properly. I used PowerPoint Version 2016 and a Mac for the tutorial, but the tools and options covered are also available for PCs. If you have an earlier version of PowerPoint, some of the options I talked about may not be available. Also, if the host computer (used to project the slideshow) is running an old version (prior to 2013) of PowerPoint, you may have problems playing your embedded videos. The reason is that older versions of Windows and Mac use linking rather than embedding, and the path to the videos may not work. I’ve gotten around this problem (going from a Mac to a PC running older versions) by putting the PowerPoint file in a folder with all the video files (it’s good practice anyway to put all images and videos used in your presentation into a single folder). I transfer the entire folder to the host computer, and most of the time the videos play fine. If that doesn’t work, it may be a problem with the video format/codec not compatible with the host computer. The only fix is to convert all your videos to the format/codec compatible with that computer. But the best way to avoid playback problems is to use your own computer during your talk.